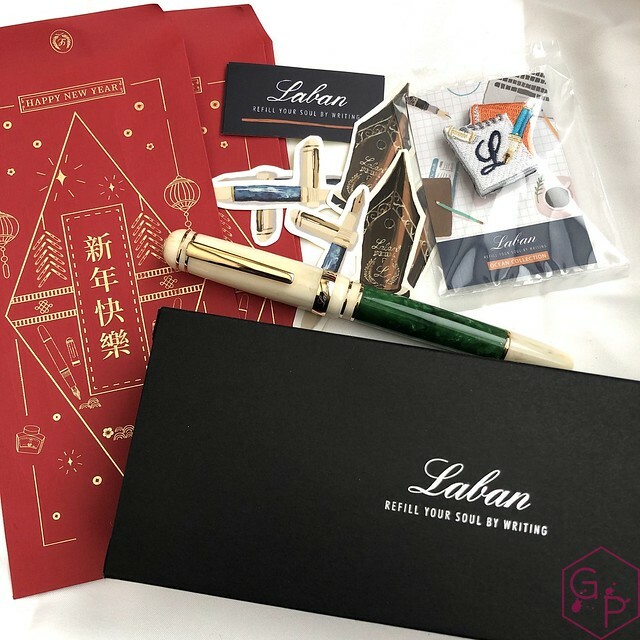 Thank you to Laban for sending this pen for a review! This is the newest color in their most recently released model. This follows the Ocean, and if you like nature, the Forest and Ocean make a stellar pair. 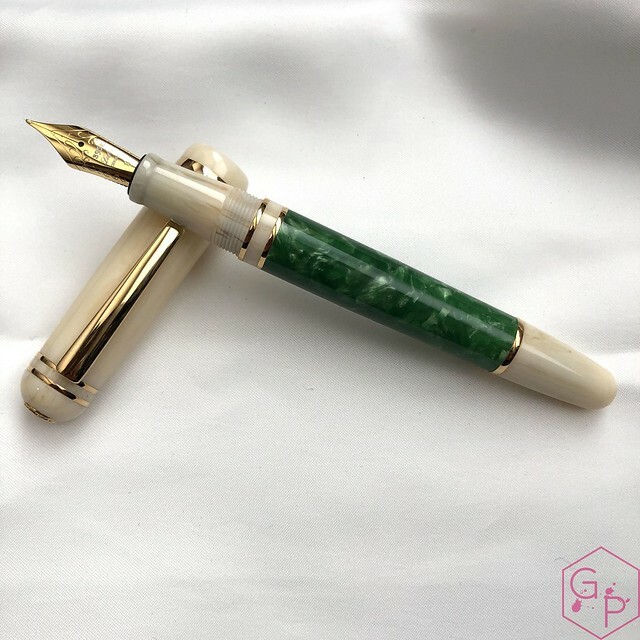 Length (uncapped nib-end): 131.3 mm/5.17"
Section Diameter: 10.0 - 12.1 mm/0.40" - 0.48"
Barrel Diameter: 10.1 - 13.7 mm/0.42" - 0.54"
The Forest is presented in a black box with a Laban-branded black sleeve. The clamshell box inside is matte black with a soft-touch finish and is branded with "Laban" printed on the top. 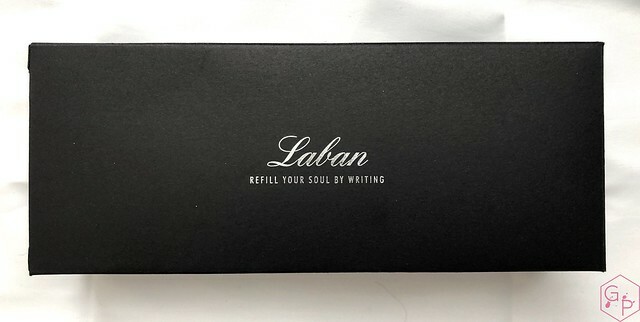 The inside is black felt with the Laban logo on the inner lid, the pen on a felt bed with a plastic tag, and a converter inside the barrel of the pen. It is attractive but does not seem excessive. I did not find it interesting enough to want to keep it. My kit came with a pin and stickers!!! MEGA EXCITE. 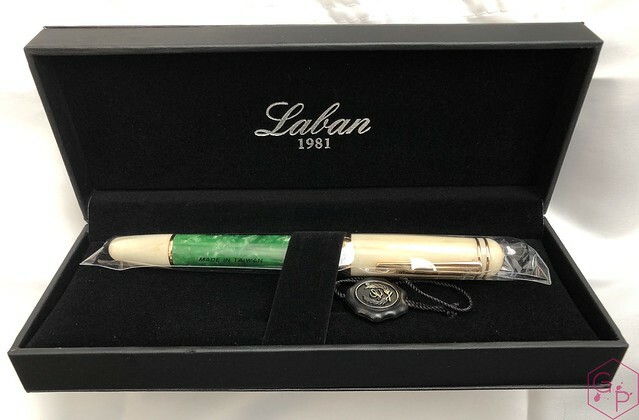 The Laban Forest is a full-size pen that appears long and slender to my eye. The cap is thicker than the barrel with a rounded top and the barrel is slightly thinner with a rounded point. This is a pretty pen but it is busy to my eye, which I don't care for so much. 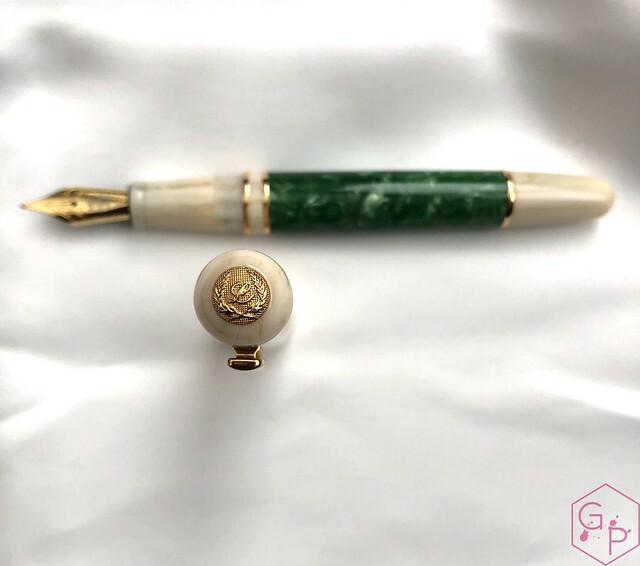 The finial at the top of the cap is the Laban logo in gold and I think it looks really good against the antique ivory resin. 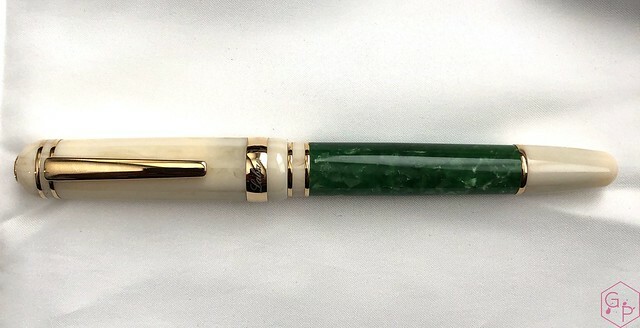 There are two thin gold rings at the top of the cap, a wide, raised center band near the end of the cap, two more gold rings on the end of the section, and a single ring at the back of the green acrylic. The clip is attached through a snug cut out in the cap, just below the two thin bands. It sticks out quite a bit and it has a blocky shape with no markings on it. There's just a lot of trim and I find it a little disruptive to the flow of the pen. The section is smooth and round, tapering slightly towards the nib before ending in a smooth ridge. 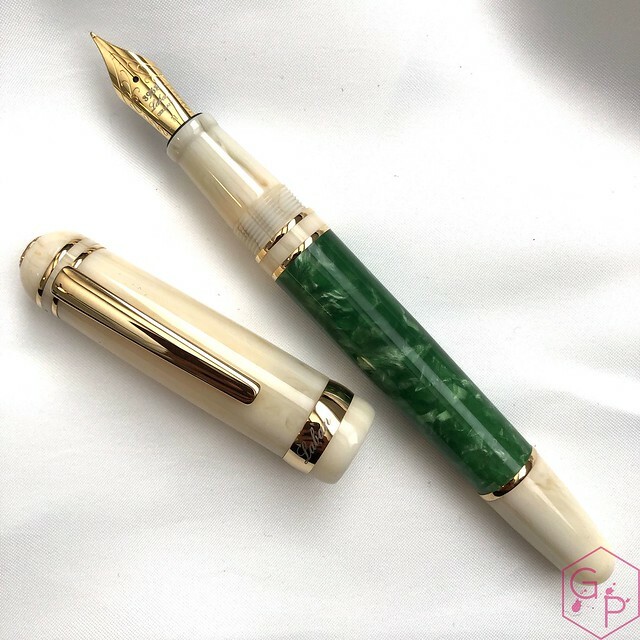 The cap, section, and end of the barrel are antique ivory resin and the large portion of the barrel is composed of this flecked forest green acrylic. This finish was inspired by lush forests with sunlight filtering through the tree canopies. 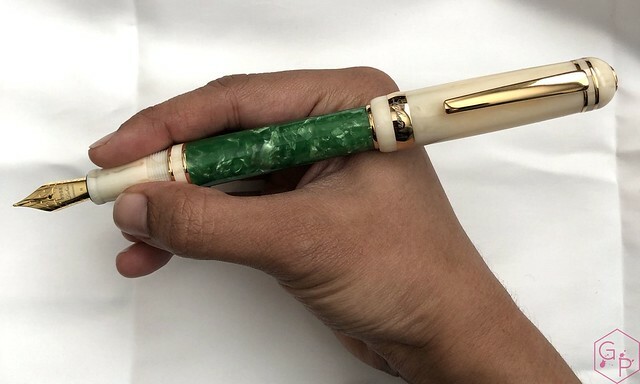 As such, the green material is flecked and glows in a few spots, and the entire pen is complemented by the warm gold trim and antique ivory resin. 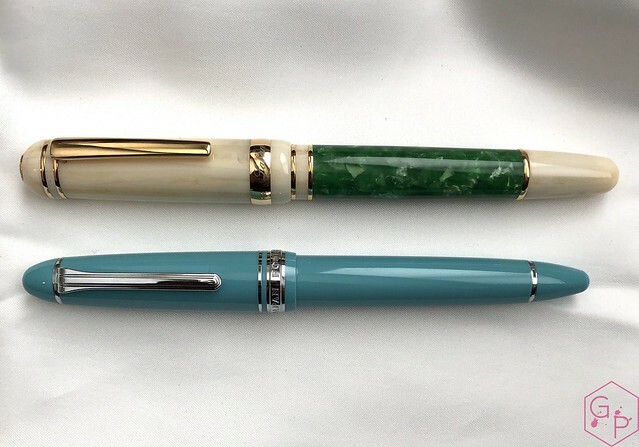 I reviewed the Laban Kaiser not too long ago and it is clear the nib has changed. This gold colored #6 nib has a single slit, a round breather hole, and is decorated with some flourishes. It is engraved with the nib size (medium) and is laser engraved with 3952, Germany, and Laban. It is a JoWo nib so I expect it to perform well. The nib is smooth, wet, and performs really well. It is well adjusted and well tuned for my preferences, writing without any skips or hard starts, keeping up with fast writing, and overall just offering a pleasant writing experience. Drying times are slightly longer than the average medium simply because it is a wet medium. You could easily adjust this to suit your needs. 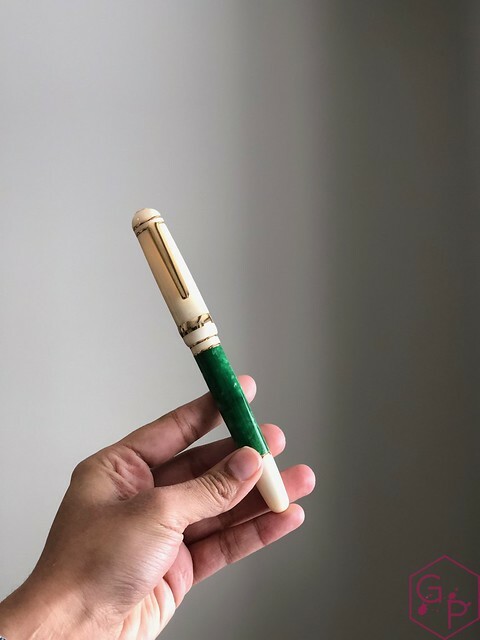 In my experience, Laban nibs always perform well so their consistency is solid and I'm always comfortable recommending them to friends or new users because I expect they will maintain this performance across the board. 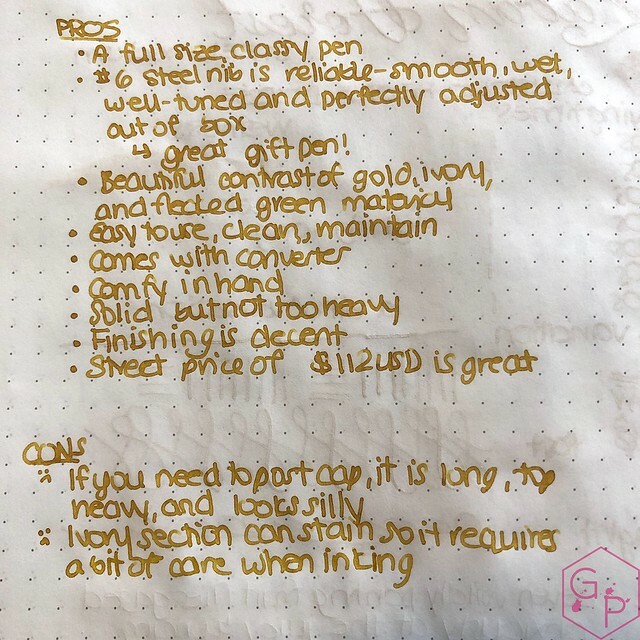 I like the writing experience here quite a bit and I would have loved a broad nib even more, so if you're looking for a smooth, wet steel nib, this is worth considering. The converter included with the pen fits the section snugly and safely and performs well. The clip is very snug and needs to be lifted to place it on papers, pockets, and pouches. I don't care for the design of the clip or how far it sits from the pen, but it does work should you need it. The section is fairly comfortable and I did not find it slippery, but the threads and ridge at the back are a little noticeable if you have a larger grip that sits off the section. Since the section is lighter, it would be best to ink through the converter or wipe the section immediately with a wet paper towel once you have inked. this will reduce the chances of staining. 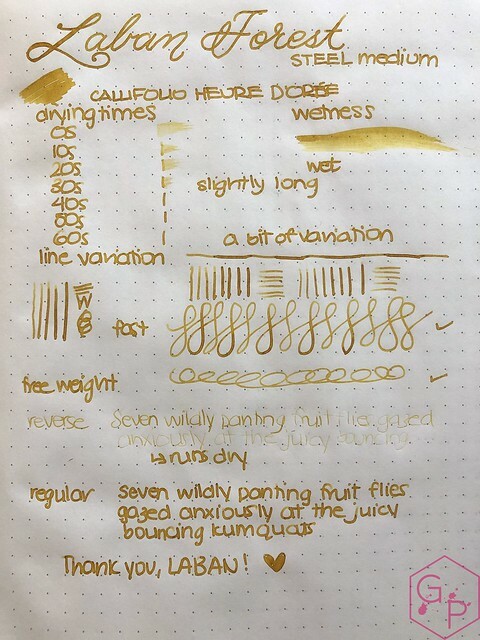 I fully expect there will be some staining eventually, especially as I expand the colors of ink I try out in this pen. Currently, I am sticking to lighter colors. Unposted, I find the pen quite comfortable - it does not feel too heavy but it is slightly front heavy so the center of balance is a little towards the nib. It does make the pen a little difficult to control as there is so much more weight near the tip. 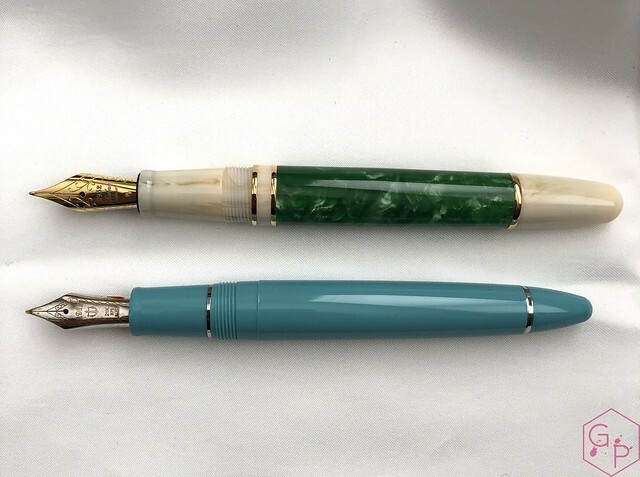 If you must post your cap, you can do so by friction but it makes the pen extra long and unbalanced, and it looks funny and out of proportion. I use the pen unposted. For those with larger hands, I think the length and weight will suit you but it is slightly slender. 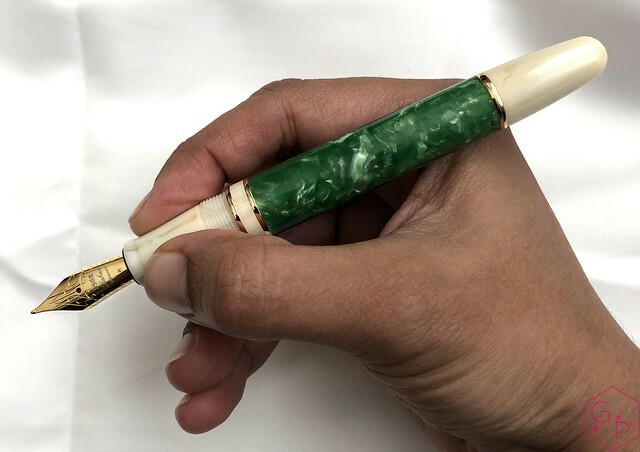 Those with average sized hands shouldn't have much issue with it unless you absolutely must post your cap, in which case I'd suggest looking at a different pen. Laban Forest, Sailor 1911 Large. 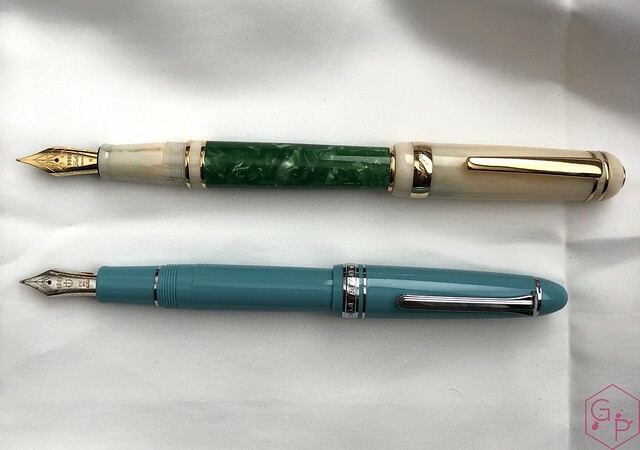 Although I have some complaints about the pen - the weight towards the nib, the amount of trim - I think the price makes the pen a great value. 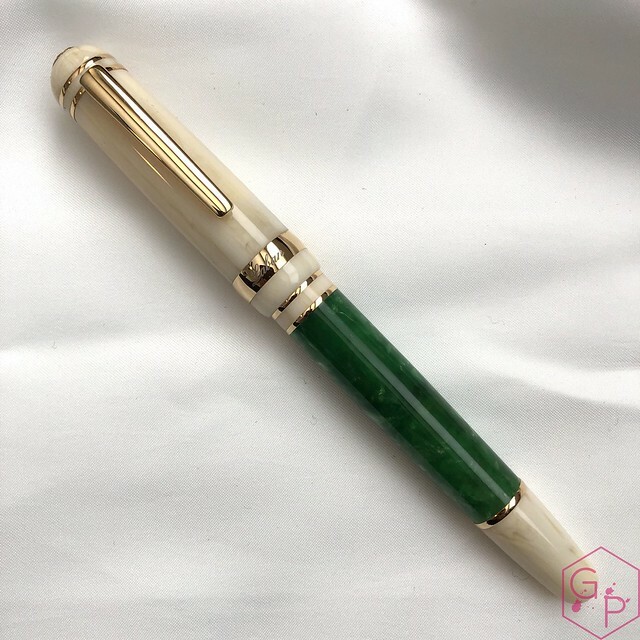 The writing experience is positive and reliable and quite enjoyable, the pen itself is quite pretty (all the trim included), and the green acrylic adds a nice pop of color. My experience with Laban over the years has been very positive and I'm glad to see nothing has changed as they introduce new models. I received this item free of charge for the purposes of this review. Everything you've read here is my own opinion. This is a sponsored review - that is, I was paid for my time and effort, but not to give a positive review.